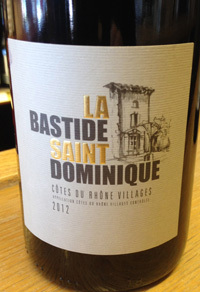 2012 La Bastide Saint Dominique, Cotes du Rhone Villages, France. For the last three vintages this Cotes du Rhone Village red has been a steal, it is a quality Rhone that offers Chateauneuf like flavors at a great price, and this 2012 is drinking great with plenty of fruit and character, making for a compelling wine. The latest La Bastide Cotes du Rhone Villages starts with tangy fruit, wild truffles and peppery spices, showing lavender, garrigue, game and kirsch in the background while the core palate offers up plum, boysenberry and strawberry essences. This 2012 is fresh, vibrant and medium weight, this is certainly a vintage to drink young, as it gives lots of immediate pleasure, best to enjoy this one in the near future. This cuvee is made up of mostly Grenache with good doses of Syrah, Mourvedre and Carignane making for a red that delivers savory elements along with a hint of baked stones to go with the sweet fruits, this is delightful stuff, drink now through 2016.